❶I actually went there when I was a kid… but it is not something I want to put my kids through… not because of class or status but because the skills and survival strategies they are trying to impart at that school are not a good fit for our kids, plus the fact we think bilingualism is awesome and will service them well through-out their lives for a variety of reasons. 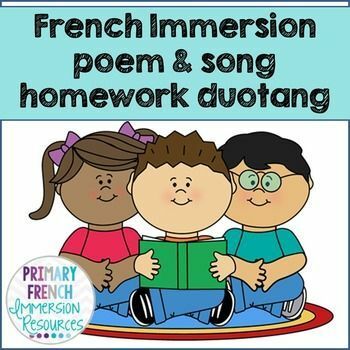 Short and clear instructions are given in French and English so non-French speaking parents can easily understand if used as homework. I have over 20 sets of weekly work and will continue to add more, so be sure to follow me! Each week follows the exact same format so students get into the routine of completing these daily. Weeks are interchangeable and do not need to be completed in order. Words in this pack: Students connect pictures to the words. Optional quiz for vendredi - This is the same as the jeudi activity, where students circle the correct word to match the picture. Having practiced the words each night, this allows you a quick assessment of their knowledge of the words. I will be adding more weekly work packs like this enough for the whole year, as well as some combined packs at a discount. I have found them to be very effective in my own early French Immersion classroom. They are very easy to implement and parents find it very straight forward and appreciate the homework being sent home each week. Just print it off on Monday, send it home and you are set: When my daughter was admitted to the local French first language school under the largely anglophone Roman Catholic board in , she had to go before an Admissions Committee as did I. There was also a test for my 3 years 6 month daughter to pass to show she knew French. She never mentioned the FFL school when I phoned her up to talk about opportunities for my children. I think most of the anglos at that school were not R. In kindergarten, there were 36 because bussing was now provided. Fast forward to NOW! The French schools in Ontario are even advertising totally in English to attract students— in the Toronto Star no less. Locally , I have billboards advertising the local FFL elementary schools. The absurd Admissions Committee procedures are still on the books, but they are not being followed very conscientiously. Besides, there is the provisions of Sec. The rules of the game have completely changed since What happens, as pp said, is the more academically inclined students with more support at home end up in FI and the English classes end up with 16 out of 20 kids on an IEP and very little extra support. Some of the more cynical staff actually think we became an FI school to get the extra funds which were not shared with the FI teachers until they put up a stink about having no resources. We have two French boards here which accept English speaking students in JK so the competition for students is fierce. There are 12 French school boards in Ontario. This applies to only French language boards in Ontario. Other provinces are less enlightened and demand that children are protected by section 23 of the Canadian Charter of Rights and Freedoms. There is no recourse to an Admissions Committee in other provinces. I teach Gr 1 FI and my students can express themselves really well by the end of their 1st year. They are proud of being second language learners and culturally enriched. I think one point missed in your commentary is that children who went through FI now have children ready for school — in larger and larger numbers. I was in the first class of FI offered in my town in NL. I want my child to have that same experience. Probably for a lot of the reasons you note. Thanks for the comment Jennifer. Sorry for the slow response. Tell me what you think. At least, in Ontario, when I went to school in the mids our high school French teachers spoke French well enough to conduct classes in French. In NL, the teachers were just shoved into the classroom to teach French. Naturally, EFI programmes were attractive to parents who cared about French. Recruit qualified teachers from the mainland if necessary. In , I had a replacement position for a woman who was teaching core French who went on maternity leave. Her students were gobsmacked when I conducted my classes in French. The grade 7 class loved it. The grade 11 class who would be writing provincial exams in 6 months thought I was overdemanding. I was shocked when the superintendent came down to evaluate my performance when he said that the teacher was considered to be one of the best teachers in the board! Maybe, she went back to school and learned some French. Hi, I have a question that is not entirely related to the discussion, but since there are a lot of Canadians in here who seem to know a lot about this matter, I will give it a try. I am not a Canadian, but I am writing a final paper on Immersion programs in Canada. Does English immersion program even exist in Canada? So, does English immersion program that is parallel to French immersion exist fixed curriculum that is content based, not language based.. There are English schools in Quebec that teach in English and teach in French. Admission to English schools is restricted in Quebec to those people who have minority language rights. There are no Admissions Committees in English language schools in Quebec. By law, in Ontario, from grade 5, English must be taught even in French first language schools in Ontario for an hour a day. Actually, judging by the remarks of various ESL teachers, I would say they think there should be less emphasis on FSL and more emphasis on ESL programmes that would help out immigrant children. Bilingual education is a real hot potato in Ontario. French immersion is a great way to learn, and it gives you many opportunities in the future. Such as, if you speak french you can go live in a french speaking ennivironment anywhere in the world. It also opens up more job opportunities in Quebec, France, Holland and other places. I am in french immersion and i love it. I can speak English and French and can now communicate with anyone who speaks these two languages. Where as if you do not know the french language you can not. Just because a person can speak french, and communicate with more people does mean that they are better then others, or that we think we should be able to do more, it just means that we have the skill set to do practically anything, anywhere in the world. Yes we need a few more school supplies, as an English dictionary will not help us with our French grammer homework, otherwise we would all be lost. If you were never in fench immersion, it is not fair to judge or say how it is, because honestly you dont know yourself. You are taking others opinions and using that as your sorce. The information you use should always be your own finidings and opinions and not someone elses. I think you might want to learn more about this program before you write an article to state your opinion. I agree with the above. I am a graduate of a French Immersion Program. I come from a low income, single parent home where my mother worked long hours and spoke only English. I think that those statistics comparing leaving fluency of Core French Students and Immersion Students lack in some areas. Many students who go to French Immersion are. They are better able to a turn a phrase and apreciate humour, even if they may make the same amount of grammar errors as students in Core French Programs. Both groups may be able to read Voltaire and write an essay, but both groups are not as well equiped to exist in francophone communities. To me, this is the purpose of language: French Immersion, like any program, is what you make of it. Your child could always go on to study French as an adult, but as someone who learnt two additional languages as an adult Russian and Spanish this is much more difficult. In immersion, you learn the language in a natural way, by hearing people speak the language. I am very fluent, from a literary point, I can pronounce words in a manner that can be understood by hispanophones and can follow conversations. I cannot however, make a play on words or be easily accepted into Spanish speaking communities the way that I can with French. In French, I am able to speak in both formal what most exams test and informal registers, just like I am english. In Spanish and Russian, I speak only in formal registers, and this makes me sound stilted to native speakers. Even if parents do choose FI for the wrong reasons, such as exclusivity, their child wins in opportunities. We need to find a way to make this choice an option for everyone who desires it. To me, that argument is just as illogical as saying your child should be allowed to chose whether or not he learns to write by hand instead of typing everything. You argue that students who do not choose to be there lack motivation, and that may be true, but some students also lack motivation to learn math. Children who are in late immersion programs do not usually develop the same levels of oral fluency as children in early immersion programs. I would never discourage anyone from enrolling their child in immersion. Having a French foundation on which to build will help them learn Spanish, Portuguese, Italian, Romanian, Catalan or any other Romance language much more easily, and other european languages somewhat more easily than a person who speaks only English. Every additional language is easier than the last. Bilingual people are also less prone to dimensia. This is evidenced by the number of adult graduates making them same choice for their children now. At the best, French Immersion will completely change the course of their lives. They might go on to become Prime Minister, a diplomate, to work in a Francophone country, to study languages or linguistics, to become a French Immersion Teacher themselves. Both of my daughters were educated in French Immersion — K to Gr. I am a former High School English teacher and understood that learning in a foreign language any language will do is like learning to play the piano. It exercises areas of the brain that lie dormant, to a great extent, without this sort of brain-expansion exercise. For kids who are able to meet the challenge of second-language education, the intellectual elites, for want of a better expression, and only a small select number are, it serves the purpose of expanding, even further, their capacity to learn. It should end — NOW. Absolutely, these FI schools chew up far more per student resources than regular public schools: And do not be fooled: Without regular, daily use of French it will not be long before they lose fluency in it completely. In that sense, it is just a very costly conceit. The only reason we are funding FI in the provinces, in Alberta we are not required to waste the hundreds of millions on it that we do , is to pander to those who already speak French! Amazing — we are willing to deepen our provincial debt load and reduce funding to English-speaking students just to make French speakers feel better, that others are learning their language, a language they will likely never use, or need, again. My children were graduated in about Their classes in EFI were huge. There were 36 students in each class. Luckily, the French first language high school was still in a large anglophone high school so they were finally reunited with French first language students. My daughter did very well at the university level. My son did very poorly in high school. Both have used their French to improve their adult lives, to do their jobs better even if they are jobs in the anglophone sector. My granddaughter is a student in an FFL school in Toronto. My goal was neither to creat a genius nor to get a government job in the French sector. My goal was to preserve the French language in Canada. My children have done me proud. I was surprised when I read that a survey of studies had found French immersion to be less effective than other bilingual ed. Here is the original reference, cited in the link that you provided: Review of Educational Research, 75 2 , Maybe you want to update your blog. He just shuffled the facts with his own opinion to have some foundation for his points. Everybody starts from scratch and progress is based on their abilities and not on the language spoken at home. This is huge point for me. Additionally, and another can of worms……. There is definitely a shortage of French teachers generally and FI teachers specifically. I can personally attest to the fact that it was the best thing my parents did for me. I do believe the difference is that I was evaluated for the program in Kindergarten. You had to have a teacher recommend you for the program back in You had to have an acumen for languages or already speak some french. But the popularity grew so much they started registering children on a request basis. The system was best back when first instituted under the pilot project years and should have remained as such. They should also not combined the schools. I was in a French Immersion school thus the teachers and grounds monitors all spoke French and would only speak and encourage the children to speak french even during recess. The program offered today is of no real value and is why I decided to send my children to francophone school instead of French Immersion. Had to go through a process of interviews to prove I was fully bilingual; but got her in and now she is looking at going to a francophone high school. Which does substantially better in EQAO testing then the rest of the province. She had never taken French in university either. She just takes it for granted. It certainly helps you understand the way we are in Canada. The biggest advantage of my having learnt French is the Constitutional right it grants me to send my child to school in French wherever numbers warrant without needing to worry about any lottery; and in Scarborough where we will soon be moving, the numbers warrant it. My wife and I are planning to have a child later and send him to French-medium school. The common unofficial language between my wife and me is Mandarin Chinese, and my wife intends to have our child learn to read and write Chinese. My Constitutional right as a French speaker to enrol my child at a French-medium school where numbers warrant it frees us from having to teach him an official language of Canada prior to enrolment. This in turn will make our time and taxes work for us by freeing us to teach our child at least one unofficial language while leaving the teaching of the official languages to our taxes as much as possible. Since he will be attending not a French-immersion but a French-medium school at least one parent of each pupil of which must know French, my child will therefore be surrounded by not only teachers but also other children who will know French, thus making everyone around him his French teacher. Since I know French, I will still be able to teach him how to do his homework and study his lessons. I could even switch to French to provide him with extra practice to the degree necessary while still leaving the heavy lifting to my taxes and focusing on teaching him an unofficial language as much as I can. The ideal situation from the standpoint of making our time and tax dollars work for us is for the parents to share a common unofficial language, at least one parent to know English, and at least one parent to know French. This way, the French-speaking parent can exercise his Constitutional right to send their child to school in French where numbers warrant while both parents focus on teaching the child at least one unofficial language and leaving the teaching of the official languages to their taxes as much as possible. We must pay our taxes, so we might as well exploit them as much as we can. This was one motive for my having learnt Esperanto. Its being from five to ten times easier to learn than English made it an ideal language to teach my future wife should she not have shared any other common unofficial language with me. One motive for my wanting to teach my child Esperanto is to provide him with the same backup plan for his children. I fully support French speakers being able to have their children educated in French. What I have commented on is French Immersion programs, which are French language programs in English schools. A very different program. For example, the French first language on the military base moved off base to the west end of Old Kingston a few years ago. Many of the students going to that school on the base went into the EFI programme still in Kingston East but at some distance from the actual PMQs on the base.